Profound is a revolutionary skin tightening treatment clinically proven to recreate the 3 vital skin building blocks – collagen, elastin, and hyaluronic acid, which work to create younger, smoother-looking skin. It’s the first temperature-controlled radiofrequency micro-needling device that provides real-time feedback from the tissue. 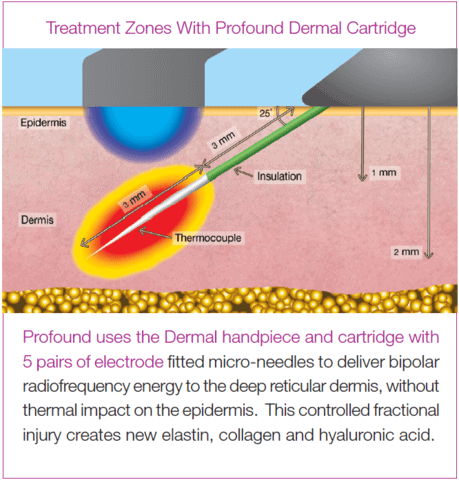 The device ensures precise delivery energy exactly where we want it – in the deep dermis. The end-point is to create multiple zones of partially-denatured collagen, which is what triggers the strongest regenerative response. This is why we can create such a profound tightening and restorative effect, all while utilising our own natural healing processes. This is another first for Newcastle, and we’re very excited to be launching it at Vamp Cosmetic Clinic. The procedure involves injection of local anaesthetic to block any pain prior to commencing. A single-use cartridge, which attaches to the dermal handpiece, contains 5 pairs of microneedles. These inject into the skin at an angle to allow for more exposure in the dermal layer. The device then delivers precise temperature-controlled bipolar radiofrequency energy into the dermal layer of the skin, and the process is repeated over the entire treatment zone. You can expect to have mild to moderate swelling and bruising, little to no discomfort post-treatment, and a speedy recovery. Because we’re stimulating the tissue to regenerate itself, the process is gradual, and the majority of effect can be seen between 3-6 months. Studies have demonstrated new dermal tissue by 10 weeks. It creates up to 5 time the elastin, 2 times the collagen, and increases hyaluronic acid all in a single treatment. Many devices deliver radiofrequency into skin aiming to achieve a restorative effect. Profound differs in that it delivers precise temperature and time-controlled radiofrequency energy between microneedles which control the depth. Profound is the only device of its kind. It reads temperature from the tissue every 1/10th of a second and adjusts the energy delivery accordingly to achieve and maintain the target regardless of skin condition. Delivering too little energy means there is less or no effect on collagen denaturation, thus minimal regenerative response. Too much means more side-effects without necessarily achieving the desired end point. RF may be delivered too superficially and not affect the dermis, or too deep and create volume loss, which is something we definitely don’t want in the face when we’re aiming to restore the volume loss associated with aging. The Profound has been dubbed the “non-surgical facelift” because of the profound results seen. Although both are aimed at reducing the appearance of aging, the two are in fact very different. We thought we’d include a brief run-down below. Price $3900* $7,000 to $30,000 depending on surgeon and procedure. Hospital and anaesthetic cost are additional. Ideal patient Mild to moderate wrinkling or laxity. Realistic expectations. Severe wrinkling and laxity. Effect Improves tightness, volume, and hydration of the skin – increases your own production of collagen, elastin, and hyaluronic acid. 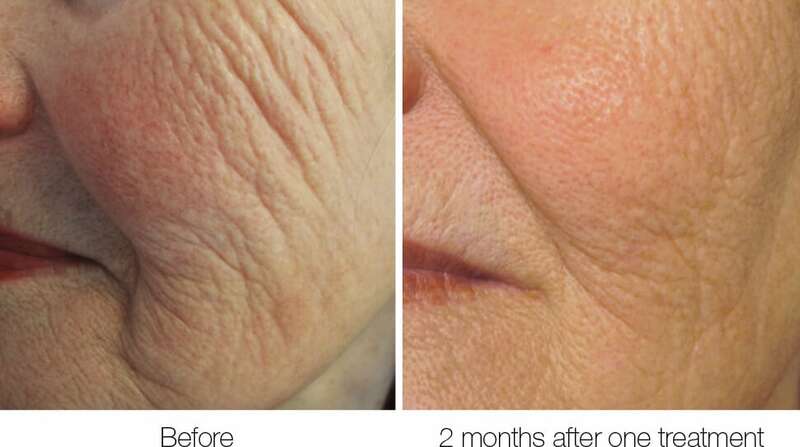 More dramatic tightening/lifting effect as skin and underlying structures are surgically removed or repositioned. No effect on skin quality. Performed in clinic and can return home immediately after. General anaesthetic and often hospital stay. Some procedures done under local anaesthetic. Recovery No incisions, thus no wound care. Can return to work the following day. Vigorous activity after a week. Very much dependant on the areas operated and technique. Sometimes requires a drain to be inserted until fluid loss settles. Sutures removed 5 to 10 days. Vigorous activity can be resumed after 4 weeks. Time to effect Majority of effect by 3 months; best effect at 6 months. Immediate effect after recovery period. Risks Mild to moderate bruising, mild swelling, mild tenderness, temporary numbness due to swelling, low risk of infection. – More significant bruising, swelling, pain and redness. – Higher risk of infection and bleeding. – If too much skin is removed the face can look pulled back or startled. – Scarring is generally small but can be widened or thickened. – Risks of general anaesthesia. Number of treatments required 1 treatment. Expected to age at same trajectory after. Can re-treat if wanting additional tightening (generally after a year). Doesn’t preclude from having a face lift in the future. 1 treatment. Often requires repeat surgery after 5 to 10 years. We’re expecting to launch the Profound very soon. You can book a consultation with Dr Monique or Dr Jake any time to discuss if this treatment is right for you.